Every day, newspapers and television news programs present stories on the latest controversies over healthcare and medical advances, but they do not have the space to provide detailed background on the issues. Websites and weblogs provide information from activists and partisans intent on presenting their side of a story. But where can students - or even ordinary citizens - go to obtain unbiased, detailed background on the medical issues affecting their daily lives? This volume in the Health and Medical Issues Today series provides readers and researchers a balanced, in-depth introduction to the medical, scientific, legal, and cultural issues surrounding sports medicine and its import in today's world of healthcare. 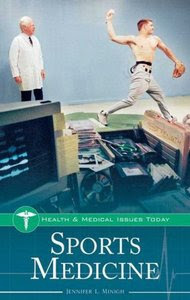 Sports Medicine is organized to provide researchers with easy access to the information they need: BLSection 1 provides overview chapters on the background information needed to intelligently understand the issues and controversies surrounding sports medicine, such as the history of sports medicine and the most common injuries and syndromes. BLSection 2 offers capsule examinations of the contemporary issues and debates that provoke the most heated disagreements and misunderstandings in the scientific, legal, and ethical issues surrounding sports medicine, such as doping. BLSection 3 includes reference material on stem cells, including primary source documents from important players in the struggle over sports medicine, a timeline of important events, and an annotated bibliography of useful print and electronic resources.